Small colourful wicker basket. THIS WOULD MAKE THE PERFECT EASTER. - chocolate lolly. - kinder chocolate. PLUSH TOY GIFT BAG. ALL PRESENTED IN LOVE GIFT BAG. 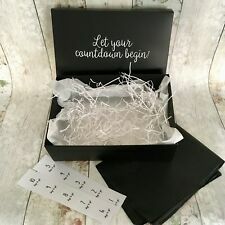 Wedding Countdown Box! Box size: approx 30cm x 20cm x 10cm. Box is a lift off lid style not a flip lid style. 2 x Kinder Bueno chocolate bars. Personalised Easter bunny rabbit chocolate hamper gift set. HUGE VALUE HAMPER - EVERYONES FAVOURITES. 6 x Small kinder chocolate bars. 6 x Kinder chocolate bon bons. Gift Hamper For Dad. 1x Socks for Dad - The Best Dad In The World (One Size). Ideal Present for dad. 1x Beer Rules! Bottle Opener / Ruler. Luxury Bath & Gift Hamper - Birthday, Anniversary, Mothers Day, Thank You. An Indulgent Hamper, containing bath and body products, chocolates and fizz (non alcoholic). Beautifully gift wrapped. This item is sure to delight the lucky recipient. Looking for a romantic gift for a cotton anniversary - then look no further! Light the massage candle and give your partner a very special warm wax massage. Ensure the room is warm and you have soft towels and warm hands. Great gift idea for any bride-to-be or couple! Gifts are presented in a white gift box which reads 'Let your countdown begin!'. Great gift idea for any bride-to-be or couple! COZY SLIPPERS LUXURY GIFT BOX. 1 x ladies pink, white or silver cozy slippers. HAND MADE WITH LOVE. 1 x walkers chocolate box. •Personalised Gift Box with Matt Gold Text. Luxury Bride Gift Hamper. The Bride Gift Box contains the following gifts •Scented T-light Candle Stack with 'The Bride' Sticker. •Silver Plated Daisy and Pearl Look Necklace with 'The Bride' Backing. CUTE AND SWEET GIFT BOX. HAND MADE WITH LOVE. ALL PRESENTED IN A LOVE GIFTBAG. 1 x floral pocket tissues. AFTERNOON TEA PAMPER GIFT BASKET. 1 x marzipan bar or belgian chocolate bar. 2 x Cadbury's hot chocolate drink. 3 x Twinings tea with envelopes. We are delighted to present our Gluten Free Fine Food GIFT HAMPER. Gluten Free (Sin Gluten ) Chocolate Chip Biscuits 200g. Each Hamper is individually made especially for you. This hamper includes ENGLISH BREAKFAST TEAS 10 Tea bags. 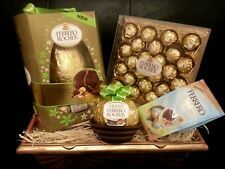 Easter Ferrero rocher Chocolate bunny Gift Hamper Grand Ferrero Ferrero lindt. Condition is New. Snowman Soup consisting of: Sachet of Maltesers hot chocolate (BBE 03/2018), Mini Marshmallows, Candy cane and 3 large chocolate coins. I specialise in hand made fabric crafting. 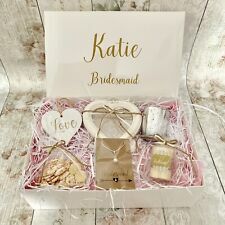 · Personalised gift box with matt gold text. Bridesmaid Gift Hamper. The Bridesmaid Gift Box contains the following gifts · Scented T-light Candle Stack with Lace Design Bridesmaid Sticker. 4 x Cadbury Milk Chocolate bars. 4 x Cadbury Freddos and;. HUGE VALUE HAMPER - EVERYONES FAVOURITES. 1 x bag of classic 'fried eggs'. Great gift idea for any bride and groom-to-be! Bride & Groom Wedding Countdown Box! This box will contain 5 gifts for the bride wrapped in pink and 5 gifts for the groom wrapped in blue. Presented in a white gift box with matt gold text which reads "Let your countdown begin!". Ideal gift for the Cath Kidston Fan. 66 Feet Jute Twine. ECO-friendly, Kraft paper & natural Jute string is total recycled and healthy. The Jute string just be cut to use. Suitable for: DAD STEP-DAD GRANDAD or ANY SPECIAL MAN. YOU CANNOT HAVE A BREW WITHOUT LUXURY BISCUITS & CAKE ! (BBE 01/2020). Thorntons Ginger Creams (128g). A Box of Thorntons Milk Chocolate Ginger Creams. LUXURY PAMPER HAMPER GIFT BOX. IT’S FULL of LUXURY SERIOUSLY SCENTED PAMPER TREATS for an EXTRA SPECIAL LADY. WHOLE LOT OF LOVE BATH FIZZER (180g). I LOVE YOU BATH MUFFIN FIZZER (180g). These super-sized muffins really do make a big splash in the tub. LARGE LUXURY PAMPER LADIES EASTER GIFT BASKET. ALL PRESENTED IN A BASKET THAT CAN BE RE USED. 1 x hand and nail care bag. 1 x heart tealight with petals and crystals and organza bag. 1 x thorntons chocolate creams box. Stuck with gift ideas?. Why not give a gift with a difference. Happy to help x. Special sister gift hamper. Go on give your mum, nan, sister, daughter, girlfriend, aunt, niece, grandaughter, friend etc a special treat. HANDCARE PAMPER GIFT SET. lindor chocolates. cucumber peel off mask. WRAPPED IN FOIL AND A BOW. pineapple spring sponge. spring pocket tissues. Go on give your mum, nan, sister, daughter, girlfriend, aunt, niece, grandaughter, friend etc a special treat. I love mum gift hamper. Stuck with gift ideas?. Why not give a gift with a difference. Happy to help x.